From a short distance, this is a magnificent and imperial looking structure. From closer up, the intricacy becomes more apparent. 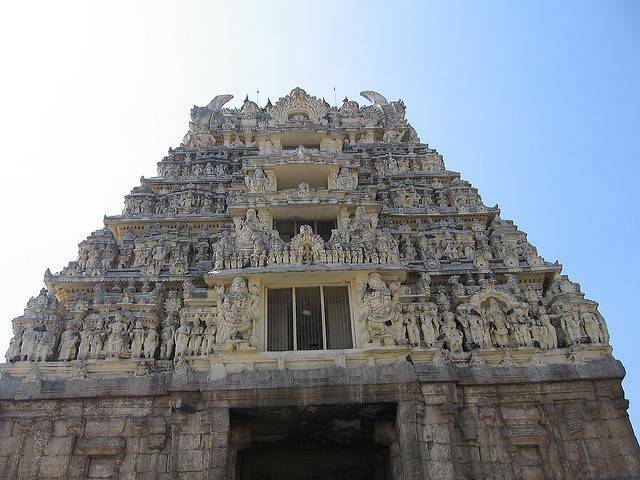 The temple is famous as one of the best examples of Hoysala architecture. Looking at the carved beauty of birds, animals, dancers and stories from the Puranas and Upanishads. The temple was finished in in 1116 by Hoysala Vishnuvardhana. Darpan Sundari, or The Lady With the Mirror, is one of the must-sees inside the Chennakeshava Temple. A sculpture found within the interior walls, there’s something sublime about the way she stands; hand on hip, mirror in hand. There are a number of other figures of celestial nymphs or Madanikas. All of these figures are said to be inspired by the mesmerizing beauty of Shantala Devi, Queen of King Vishnuvardhana.